Our district has bought into Understanding by Design, a useful (though not unique) method for designing curriculum that emphasizes the interesting end of Bloom's taxonomy. Part of our task at a recent workshop was to develop an "enduring understanding" for a unit. Big ideas, enduring understandings, whatever you want to call them, drive the units. Our group picked evolution as the unit. Predictable enduring understandings emerge--species change over time, species evolve from pre-existing species, natural selection drives speciation. We say it, we teach it, and we miss it. Darwin struggled with his thesis. He twisted it inside out, passionately looking for flaws. He would have been a happier man had he found them. He did not because, fundamentally, his thesis is sound. With evolution, form does not follow function. Giraffes do not have long necks because they want to eat leaves, humans did not develop thumbs in order to grasp things better. Mutations are random. Meiosis and sexual reproduction create tremendous variations in individual organisms. The organisms who thrive in their particular environment are more likely to reproduce successfully. Earthworms and horseshoe crabs and the double-wattled cassowary have been evolving as long as we have. 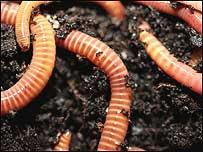 For all our talk of being advanced, none of us could survive long if tossed into the same habitat as the earthworm. If a particular form does better in a specific environment than a different form, it is more likely to persist. There is no "want" or "desire" involved. What ultimately succeeds is not necessarily random--a fusiform fish can swim faster than a round one, and it's not surprising that many fish are streamlined. Still, an ancient fish did not ponder its fate and hope to become fusiform. Form did not follow function. Survival followed form, but that's not the same thing, not the same thing at all. Early hominids walked upright, that much we know from the fossil record. It may well have been the result of a mutation, an accident. Lucy did not say, "Hey, I can walk!" Her parents did not say "Hey, if we stand up straight we can pick more fruit!" The front limbs, now freed, became useful for other things, but not because of any planning. There is great comfort believing that something guides the universe, and there is enough order in the chaos around us for a few of us to maintain that belief. Humans could have happened anyway. We're not special, or rather, we're no more special than the horseshoe crabs and the earthworm and the double-wattled cassowary. 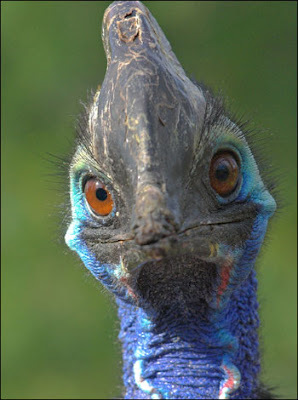 Thankfully for me anyway, I think the double-wattled cassowary is pret ty special. The double-wattled cassowary and the worms are from the BBC here. Leslie took the horseshoe crab photo. Have you read Michael Pollan's The Botany of Desire? I thought his premise had to do with want and desire. It isn't about evolution, it's about reproduction which gets tangled up in the whole process - what little I understand of it. The closest I get to understanding biology is biochemistry which is a long way from macroorganisms and evolution. Yes, and I loved it--we have a copy floating around home somewhere. "Want" and "desire" are real, and there is a survival advantage to organisms with a desire to live (as tautologous as that sounds), but the process of evolution itself does not require it. You're right to bring up domestication of plants and animals (and humans--our co-evolution with domesticated organisms changes us as well). Human desire and wants do influence other species' traits directly, so form does follow function in that sense. Hey Doyle- been a while. I used it quite a bit in my honors botany class a few years back (a course I taught for over ten years and haven't for the last three). Fruit is a wonderful "strategy" for getting seeds into a warm, acidic digestive tract. I think you see where this is going. Jantzen's paper resulting from this initial find was published in Science in 1982. I need to get my hands on that book. Underlying all this is my own faith, crazy as I may be. It's not all random. I have no idea what it is, but it's not all random. On a good day, it's enough just to be conscious of being part of it. On a great day, it's enough just to be part of it without being conscious of it. I'm human and I feel special. Do you think I'll evolve better or will my naivete leave me susceptible to selection? Alas, populations, not individuals, "evolve"--and if naivete appeals to women, then your fitness may be greater than you imagined.